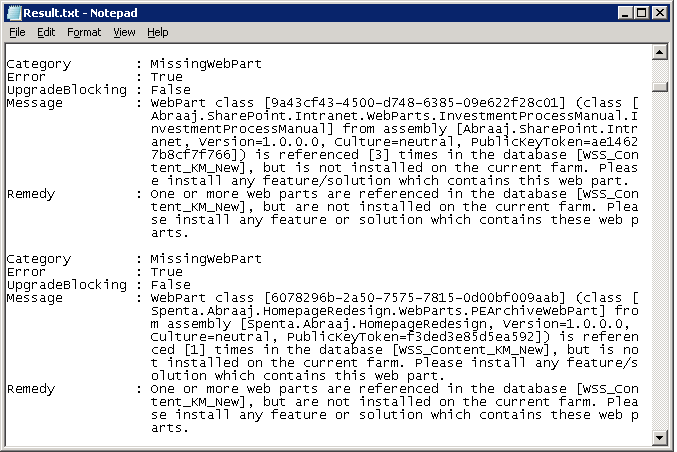 Problem: MissingWebPart Issues when running Test-SPContentDatabase cmdlet on SharePoint content database during SharePoint 2013 migration project. Message : WebPart class [9a43cf43-4500-d748-6385-09e622f28c01] is referenced  times in the database [WSS_Content_Database], but is not installed on the current farm. Please install any feature/solution which contains this web part. Remedy : One or more web parts are referenced in the database [WSS_Content_Database], but are not installed on the current farm. Please install any feature or solution which contains these web parts. Root cause: MissingWebPart issue is because, the migrated SharePoint 2013 sites contains references to custom Web Parts which are not installed in the target Farm. Install & deploy the solution package (WSP) which contains the webpart to your new SharePoint 2013 farm to fix this issue! Well, that wouldn't be a case always, What if you don't really need the webpart anymore in your SharePoint and want to get rid it? Use this PowerShell script to find all pages which are using the particular web part in your environment. $Query = "SELECT distinct ID,SiteId,DirName, LeafName, WebId, ListId from dbo.AllDocs where id in (select tp_PageUrlID from dbo.AllWebParts where tp_WebPartTypeId ='$($webPartID)')"
This script gets you the list of pages where the missing web part is being referenced from. How to Delete Web Part from SharePoint Page? In the web part maintenance page, Select and delete the unwanted web part! How about removing a web part from the entire site collection or web application rather one by one? Well, PowerShell is your friend! Here is the PowerShell script to remove a web part from SharePoint site collection: Remove a web part from page using PowerShell in SharePoint. Yeah.. That helps to remove Hard-coded server name! Thanks, Henrik! !